What to do and see in Salamanca? The province of Salamana borders with Portugal and the provinces of Zamora, Ávila and Cáceres and is one of the most magic provinces in Spain. Fertile lands watered by the riveres Duero and Tormes, vast pastures used for cattle and pig farming, spectacular natural parks, including the Arribes del Duero and Peña de Francia, picturesque villages lost in time, and of course , its majestic capital, the City of Salamanca, a World Heritage City, European Culture Capital in 2002, Spain's oldest university and one of its most beautiful and monumental cities in the country (many would say the most). Salamanca is city reminiscent of Oxford or Cambridge in the sense that it seems to breathe art, culture and knowledge as you walk along the streets and admire its señorial houses, small palaces, university buildings, towers, churches, the cathedral.... . For the best panoramic view of the city, go to the Parador of Salamanca on the other side of the River Tormes. Popular with thousands of foreign students who come to Salamanca each year to study one of the Spanish language and culture courses offered by the University or one of the seemingly hundreds of acadamies, Salamanca is a cosmopolitan, lively city. Like most parts of Spain, Salamanca was occupied by the Romans and Visigoths. During Moorish occupation of Spain power toed and froed between the Arabs and Christians. In the 11th Century Alfonso VI consolidated Christian rule and appointed Count Raimundo de Borgoña, to rule over the city. This was the beginning of Salamanca's recovery, as the new stability encouraged people from all over the Iberian Peninsula to make their home in the city. In the 12th century the Old Cathedral was built and as it became a center of study, the seeds of one of Europe's first universities were sown. As the center of study grew, so religious orders and scholars started flocking to Salamanca, and their presence consolidated the University. 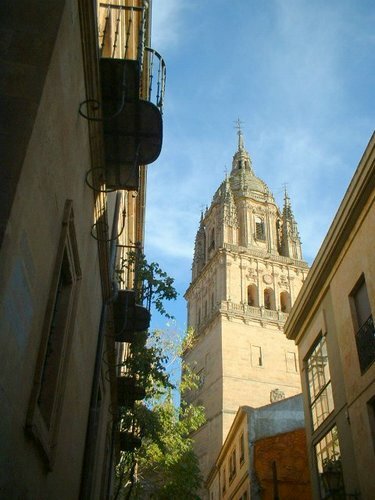 Convents were built, money was donated by the Catholic church leaders, residences for scholars were built, and Salamanca became Spain's most important city during the Renaissance period, resulting in the so-called Spanish Golden Age (Siglo de Oro) when Spanish art, literature and music flourished. 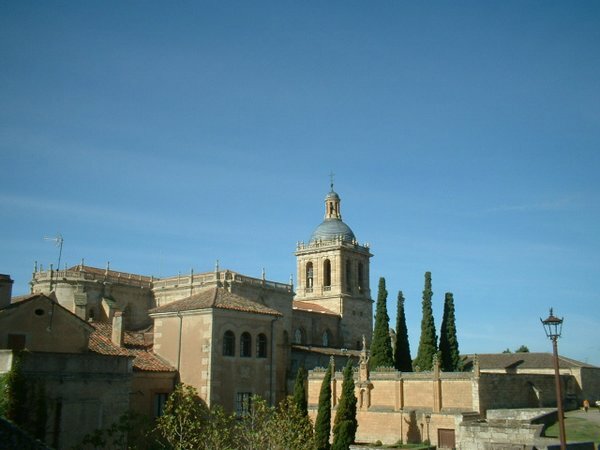 Fray Luis de León, Antonio de Nebrija, Lope de Vega, Christopher Columbus, Calderón de la Barca, Teresa de Jesús, San Juan de la Cruz, Cervantes and Christopher Columbus all spent part of their lives in Salamanca. See photos of Salamanca. The Plaza Mayor: Probably the best place from where to start walking aroundSalamanca, and where to have a cafe con leche or glass of cold water at one of the tables set up by the bars and cafes in the square. Built in the 18th century. The University: Beautiful architecture and the famous plateresque façade with the hidden frog. The Old University Library is simply awesome, with shelves full of old literary and scholarly works of art. 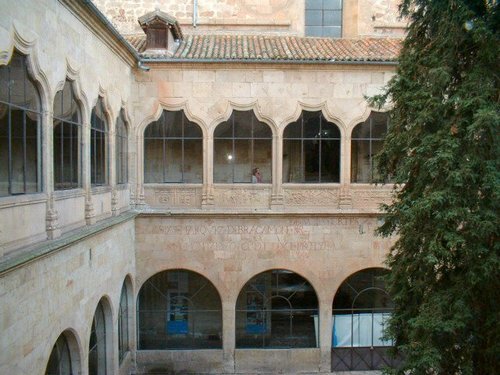 The library has over 160,000 volumes.Also visit the cloister, the paraninfo and the surrounding Universitybuildings.See photos of the University of Salamanca. 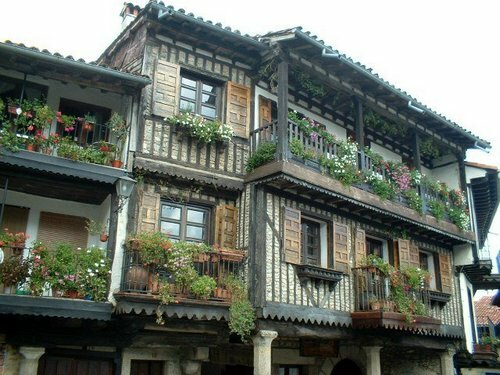 Casa de las Conchas: Renaissance. One of Salamanca's most emblematic buildings. Today it is an art gallery and library. Catedral Nueva: The New Cathedral of Salamanca. Again unique inthe decoration of the façades. Romanicand gothic - a mixture of styles since the work on the new Cathedral began in the 1400s and ended in the 1700s. Convento de las Dueñas: Convent founded by Juana Rodríguez Maldonado in1419. Beautiful cloister. Thenuns sell pastriesand sweets to visitors. Clerecia: Unfinished example of religiousbarroque art. A huge cupola,magnificent 12th century altarpiececovered with gold and stairway. Casa Lis Museum: Art nouveau and Art Deco, the Casa Lis Museum receives more visitors than any othermuseum in the whole of Castilla y Leon. Open Tuesday-Friday 11.00-14.00 and 17.00-21.00. Sundays and public holidays 11.00-21.00. Museo de Bellas Artes: Art museum, open Tuesday to Saturday, 10.00-14.00 and 17.00-20.00. Sundays and public holidays 10.00-14.00. Palacio de La Salina: 16th century structure attributed to Alonso de Fonseca. Headquarters of the Provincial government, this building has a beautiful indoor patio. Colegio del Arzobispo Fonseca: Rennaisance patio. Cultural activities are organised here in the Summer months and next door there is a former hospedería (hostal) where art exhibitions and other cultural activities are held all year round. Cueva de Salamanca: Where, according to legend, the devil used to teach scholars everything that their religious teachers would not teach them. Huerto de Calixto y Melibea: Lovely garden where supposedly Calixto and Melibea used to meet. Iglesia de San Martin: 12th century church next to the Plaza Mayor. Romanic façade. Convento de San Esteban: Spectacular plateresque façade where in the center abovethe entrance is Ceroni's Martyrdom of St. Stephen (1610). The church, designed by Juan de Álava in the shape of a Latincross, was begun in 1524. The beautifu inner courtyard is a blends Gothic andRenaissance styles. Casa-Museo de Unamuno: House of Miguel Unamuno, the emblematic philosopher and scholar who was Rector of the University of Salamanca for two long periods until Franco's troops put him under house arrest until he died. Ciudad Rodrigo: Ciudad Rodrigo sits on top of a hill just next to the border dividing Spain from Portugal, and the wall surrounding this small town (14,000 inhabitants) reflects its strategic importance in the past. Occupied by Neolithic settlers, Vettones, Romans, Moors and finally Christians. In the 12th centuryCount Rodrigo González Girón give his name to the city, and some years later the cathedral wasbuilt. During the 15th and 16th centuries Ciudad Rodrigo flourished, and many of the small palaces and stately homes built during that period are still standing today. Ciudad Rodrigo is a bit like a minature Salamanca. Visitors are advised to stay in the beautiful Ciudad Rodrigo Parador and to enjoy strolling around this sleepy town which oozes history on every street. Se photos of Ciudad Rodrigo. La Alberca: Beautiful small village - just over one thousand inhabitants - with narrow picturesque streets, unique half-timbered houses with geraniums hanging over the balconies. And although it has become more crowded with tourists (mainly daytrippers) in the last few years, Alberca still retains the unique charm to which it owes its growing fame, despite the inevitable shops for tourists which spill out onto the streets. Local fiestas in August are a mixture of pagan and religious celebration, so typical of rural Spain. Set in the heart of the Sierra de France, a beautiful range of mountains, at the foot of the Peña de Francia and surrounded by fertile lands, Alberca is just 73 km. from Salamanca, and the drive there is lovely. If you go in Autumn, try one of the local dishes with setas, wild mushrooms. See Photos of La Alberca. Alba de Tormes; Village just 20 km. from Salamanca set on the banks of the River Tormes in a lovely setting. Visit the 16th century Carmelitas convent - Convento de la Anunciación - where the remains of Santa Teresa are buried. 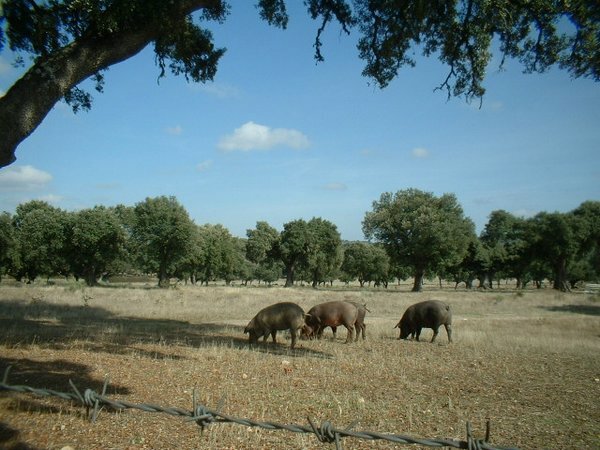 Valle de las Batuecas: Beautiful unspoilt and unpopulated countryside, with all sorts of differentflora and fauna. Home to deer, mountain goats, golden eagles, black vultures and even lynx (an endangered species). Perfect for driving, stopping and walking. Se photos of Salamanca Province.